Thirty two journalists have been murdered in Mexico since 1992, according to the Committee to Protect Journalists. Despite the dangers, young reporters like 25 year-old Gaby Rasgado remain determined to report the news. Despite the danger, young people there continue to be attracted to the news business. Among them is Gaby Rasgado. Barely five feet tall, with a baby face and wearing her jet black hair in a thin multicolor braid, she could easily be mistaken for a student. However, she's a 25-year-old reporter whose five years of experience give her veteran status. Gaby Rasgado, covering a demonstration by fellow journalists protesting the rising violence against reporters in Mexico. Rasgado is a correspondent for Mexico's "La Silla Rota," a political online news magazine where she's won various Mexican journalism awards. Her focus is in-depth investigative reporting, covering politics, social advocacy, immigration, safety issues -- and staying alive. 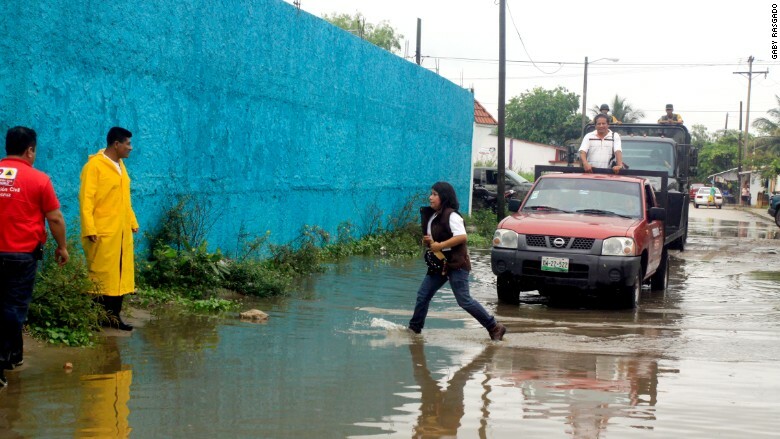 She's based in Xalapa, the capital of the state of Veracruz, one of Mexico's most dangerous places to report from. Rasgado has lost friends and colleagues to violence tied to their coverage of political corruption and narco-war coverage. Of those killed, the one who was closest to her was crime reporter Gregorio Jiménez de la Cruz. His body was found in February 2014 in the eastern Veracruz town of Las Choapas. He was abducted by an armed group, according to published reports. "He's the one who was closest to me," she said in an email interview with CNNMoney. Rasgado has become an expert on how to report and survive in Mexico. In late October she was among a panel of journalists invited to Mexico City by the National Association of Hispanic Journalists, an American organization, to share their safety tactics and views on the state of journalism. Rasgado has participated in various self-defense and survival workshops organized by "Artículo 19," a journalist self-protection group. "In Coatzacoalcos, Veracruz, where I'm from, I never took a cab straight to my front door," she says. "Now I do the same in Xalapa." If there's anything that she's learned in the past it's not to keep odd situations to herself. "When I notice something strange, I make sure to mention it to my trusted network of contacts," she says. "I tell them where I'm going when on assignment. I also let my family members know my whereabouts. Everyone knows what to do if I go incommunicado." 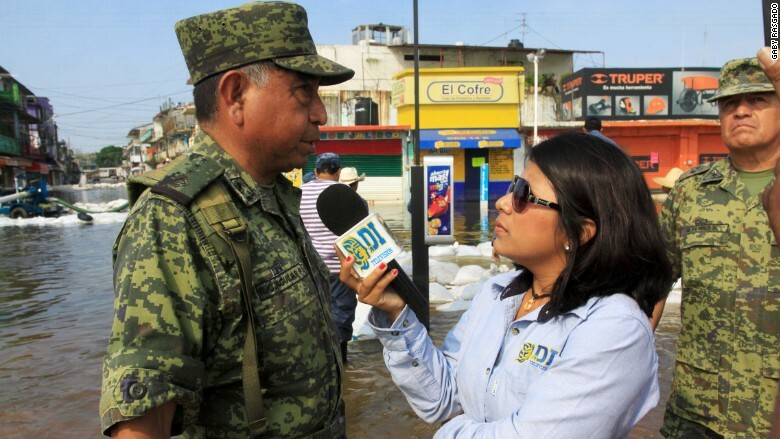 Covering flooding in the State of Veracruz. Rasgado -- who has worked with outlets like the Associated Press, CNN Mexico and Univision -- says her salary is pretty low, but in Xalapa she's earning more than she did working on TV in her home town. She makes about about 6400 pesos ($382) per month. And her family has been putting a lot of pressure on her to do something else. Journalist murders in Mexico seem to get shrugged at by Mexicans, desensitized by the daily drumbeat of violence and murder associated with the cartels and the government's supposed war against them. In Mexico, the media is almost hated. A recent poll found that Mexicans hold the media in the same contempt as politicians. The media is perceived to be the facilitator of political corruption by many. The reality in Mexico is that journalists are being killed with near impunity, says the Committee to Protect Journalists. Journalists gather to demonstrate against the murder of their colleagues. The most recent victim was Ruben Espinoza Becerril on July 31, 2015. He was a photographer, found shot in the head in an apartment in Mexico City. He fled Xalapa to Mexico City because it's perceived as a safe haven. He left after getting threats and noticing people outside his home, he told the Committee to Protect Journalists. He often covered activist causes, the group's website reported. 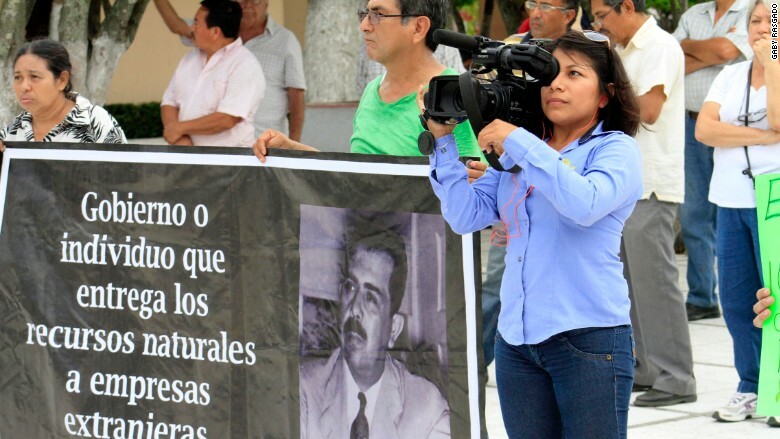 - Filadelfo Sánchez Sarmiento, a news director in Oaxaca, was killed on July 2. He was gunned down leaving the radio station where he worked, CPJ reported. - Armando Saldana Morales was killed sometime between May 2 and May 4, 2015. His body was found in the state of Oaxaca, CPJ reported. - José Moisés Sánchez Cerezo's mutilated and decapitated body was found on January 24, 2015 in the State of Veracruz. He founded a small weekly newspaper that often criticized city authorities, CPJ reported on its site. - Octavio Rojas Hernández was killed on August 11, 2014. He was shot four times, according to CPJ. The list goes on. 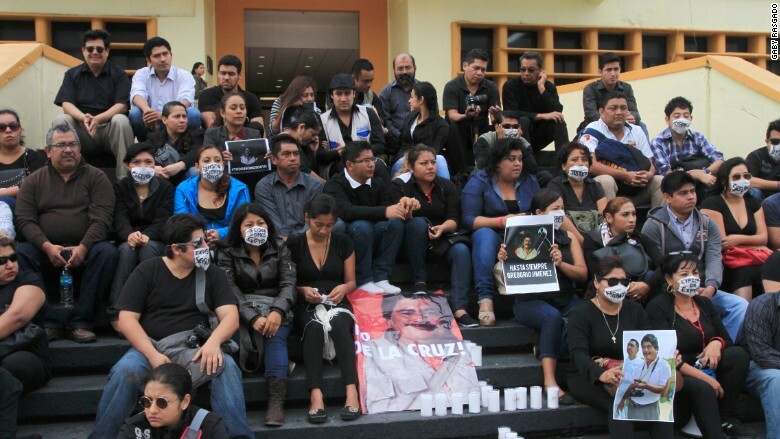 Thirty-two journalists have been murdered in Mexico since 1992. Rasgado and her fellow reporters have banded together to try to maintain their safety. "It's up to the journalists to come together and take care of themselves," says Rasgado. "My fellow journalists and I have unified to demand justice for each case." Rasgado and others remain resolute in their pursuit of journalism. "Our only weapon is to do more journalism," she says.